Members of the 305th Aerial Port Squadron and Federal Emergency Management Agency’s Pennsylvania Task Force 1 load cargo onto pallets during training April 21 at Joint Base McGuire-Dix-Lakehurst, New Jersey. Mobile teams consisting of approximately 80 personnel, trained in search and rescue, extraction and triage care, as well as relief workers deploy to aid affected communities. The joint base is Pennsylvania Task Force 1’s point of departure should they need to be airlifted. 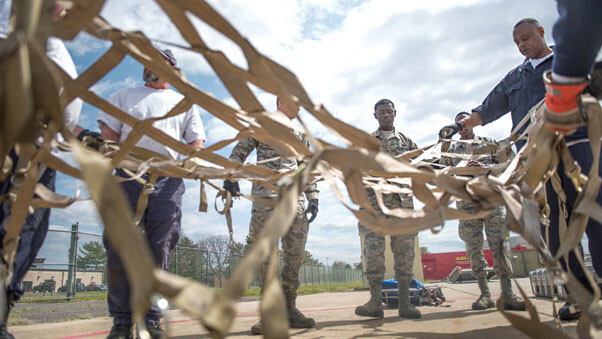 JOINT BASE MCGUIRE-DIX-LAKEHURST, N.J. — The 305th Aerial Port Squadron welcomed members of the Federal Emergency Management Agency’s Pennsylvania Task Force 1 to Joint Base McGuire-Dix-Lakehurst for rapid air mobilization training April 21, as part of an ongoing partnership initiative. 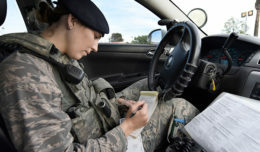 FEMA are the nation’s experts in rapid response in case of humanitarian crises and to maintain their qualifications in air transport, they reached out to base officials for training. The training was a culmination of nearly two years of collaboration between the agencies and consisted of both lecture and practical application, all geared toward optimizing FEMA’s ability to rapidly deploy in case of a natural disaster requiring airlift. FEMA responds to natural disasters like hurricanes Sandy and Ike, as well as earthquakes like the one that devastated Haiti in 2010. Mobile teams consisting of approximately 80 personnel, trained in search and rescue, extraction and triage care, as well as relief workers deploy to aid affected communities. The joint base is Pennsylvania Task Force 1’s point of departure should they need to be airlifted. During the training, instructors from the 305th APS and members of the task force’s mobile search and rescue team went through the process from notification to departure. They discussed previous scenarios, paperwork and cargo requirements. Finally, together they built a pallet with required cargo based on aircraft specifications. “An event like this helps us identify deficiencies that either they or we didn’t think of, and then we can go back, put them down on paper and formulate a plan and move forward so that when there is a national crisis, we can execute as efficiently as possible,” Pagurek said. According to training team members, both instructors and students gained something from the training.